Bed and breakfast in Halifax. Halifax is in the Calderdale area of Yorkshire and was built on the cloth trade dating back to the 13th century. Halifax has glorious architecture, galleries, theatres and the 18th Century Piece Hall, with 50 different shops, three weekly markets and an art gallery. The Piece Hall is possibly the biggest landmark in the area. Halifax is a jewel of West Yorkshire with a unique landscape setting. Halifax Town football club & Halifax RLFC play their games at the Shay Stadium (Tel: 01422 434212). Eureka - situated by the railway station and was the first interactive childrens museum in the UK. The Victoria Theatre is owned by Calderdale MBC and offers a wide variety of entertainment. Halifax is also home to the bank of the same name. Also see Halifax & Halifax attractions. If you are in the right town but cannot find the accommodation you want on this page, you might consider Halifax hotels & self catering accommodation in Halifax. This family-run hotel is in the town centre, 500 metres from the main HBOS office and 600 metres from the Victoria Theatre. 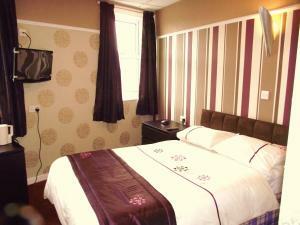 It has free Wi-Fi and refurbished en suite rooms. Milan's Hotel is close to the town's shops, bars and restaurants. Halifax Rail Station is 700 metres away. Each room has a shower or a bath and is is individually decorated with its own unique charm. A tasty homemade breakfast is available each day. Homemade food is served in the bar area or can be served in your room. All of the good-value food is made on the premises by the hotel's chefs, using fine local ingredients. Food is available on Saturdays and Sundays with prior notice. Well placed for the M62, this Premier Inn hotel has free parking and an attractive canalside location. Halifax Rail Station and the HBOS Head Office are a 5-minute drive away. The Premier Inn Halifax is 500 yards (450 metres) from Calderdale Royal Hospital and 1.4 miles (2.3 km) from the Halifax Bank of Scotland offices. An on-site Brewers Fayre restaurant serves good-value pub-style meals. Some rooms can take 2 adults and up to 2 children (under 16 years). The 2 children also get a free full breakfast when accompanied by an adult eating a full breakfast. The full all-you-can-eat breakfast has the expected cooked items, including vegetarian sausages, as well as a wide continental selection. Directly opposite Halifax Railway Station and offers easy access from M62. Built as a Coach Inn during the early 1800's, this traditional Halifax hotel offers a warm welcome. It enjoys a central location and is directly opposite Halifax Railway Station and offers easy access from M62. A friendly hotel with traditional Yorkshire hospitality and modern amenities in the heart of Halifax, opposite Halifax railway station and Eureka Science Museum. Halifax is fortunate in having beautiful buildings, good shopping, excellent theatres and a wide variety of pubs and clubs. Halifax has an outdoor market which is held three times a week. The outdoor market is held in the Piece Hall courtyard. Just 3 miles from Halifax, this family-run 17th-century inn has a restaurant offering excellent locally sourced food and a cosy bar. There is free Wi-Fi and traditional log fires. Each homely en suite bedrooom at Shibden Mill has a flat-screen TV, DVD player, tea/coffee and bathrobes. Guests have access to a DVD library. Shibden Mill Inn is in the Shibden Valley, overlooking Red Beck. The Mill has been renovated to retain its original charm and character. For bed and breakfast accommodation in other areas near to Halifax Yorkshire see bed and breakfast in Brighouse & bed and breakfast in Bradford.